This past weekend included lots of fun and LOTS of junkfood. Friday night we went to Nick’s favorite place, Buffalo Wild Wings, for beer & wings, and followed that up with ice cream on the way home. Saturday’s Mardi Gras activities included snacks, drinks, cookies, corndogs and late night Mexican & sushi. Sunday we snuck in a greasy brunch before leaving Alabama. Not the healthiest of weekends. So Sunday night, when Nick said he wanted a salad for dinner, I was kind of excited. Big salads are one of my favorite meals and he rarely EVER makes this request (salads don’t normally contain enough meat). 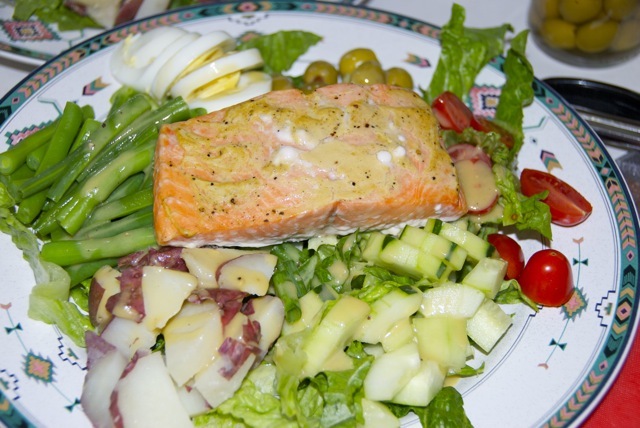 When I was living in Paris, one of my favorite meals to order at little cafes was a salade nicoise. It’s been a while since I’ve had a good one. 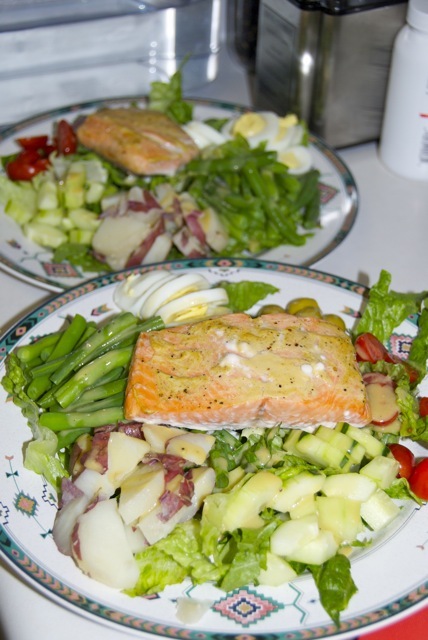 I thought with the fish, eggs and potatoes, this salad might come close enough to a “real” meal to satisfy my meatatarian, so I decided to make it. This salad is typically topped with tuna, but since Nick apparently had a traumatic experience with canned tuna at OCS, I substituted baked salmon instead. This isn’t an easy throw-together salad. Between baking the salmon, boiling the eggs and potatoes, blanching the beans, cutting up all the veggies, and making the dressing… it took me about an hour and a half, start to finish. But if it’s Sunday and you have nothing better to do, I promise, it’s totally worth it. Baked for 15 min at 375 degrees. Meanwhile, I chopped up all my veggies. And made a honey mustard dressing. I’m not a fan of bottled dressings. My dad always made quick homemade dressings when I was growing up, and I followed suit. 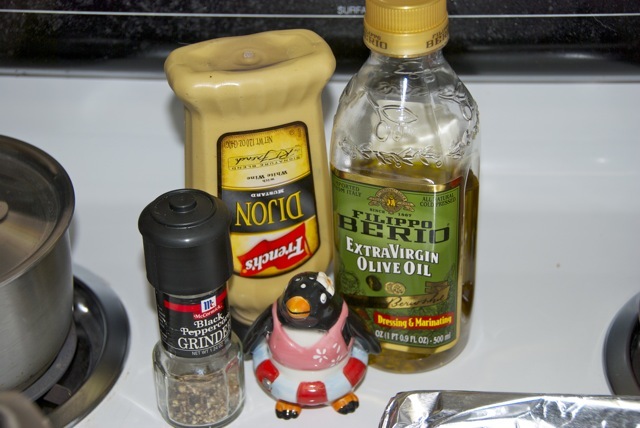 I almost always make homemade dressings (exceptions being if I’m super lazy or in a rush). They’re so easy and so much better (and healthier)! 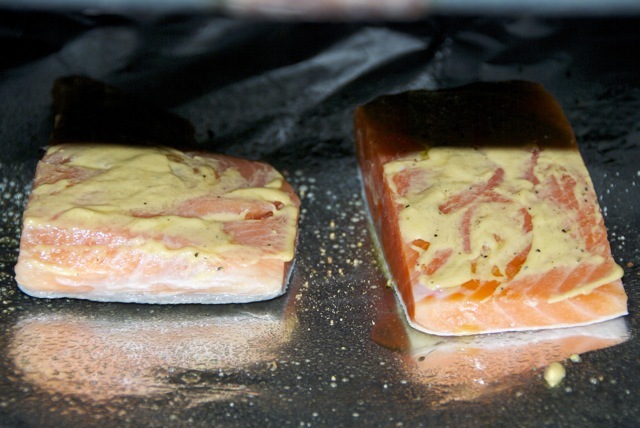 For this one I used dijon mustard, honey, apple cider vinegar, salt, pepper and olive oil. No measurements, just start mixing and adjust to taste. 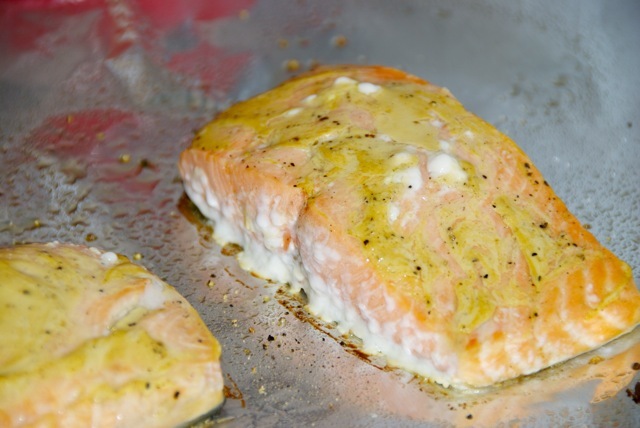 Mix everything but the oil, then slowly drizzle that in while whisking. Kaiser ate with us… doesn’t his look just as appetizing?? 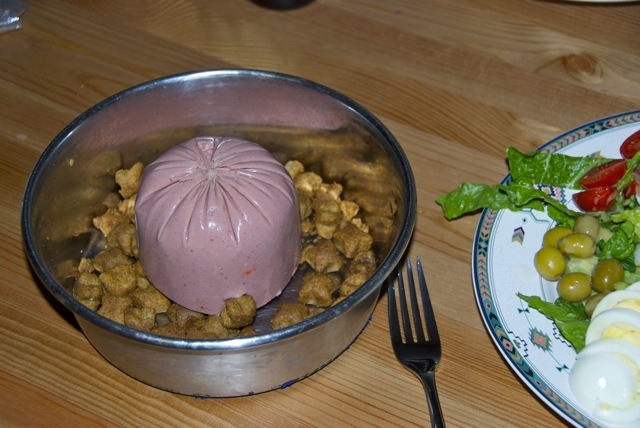 Yum, doggy bologna. « Mini King Cakes for Mardi Gras! We had this salad this weekend. It was delicious and you don’t feel soo bad about loading up your plate! A little crusty french bread is the perfect partner.